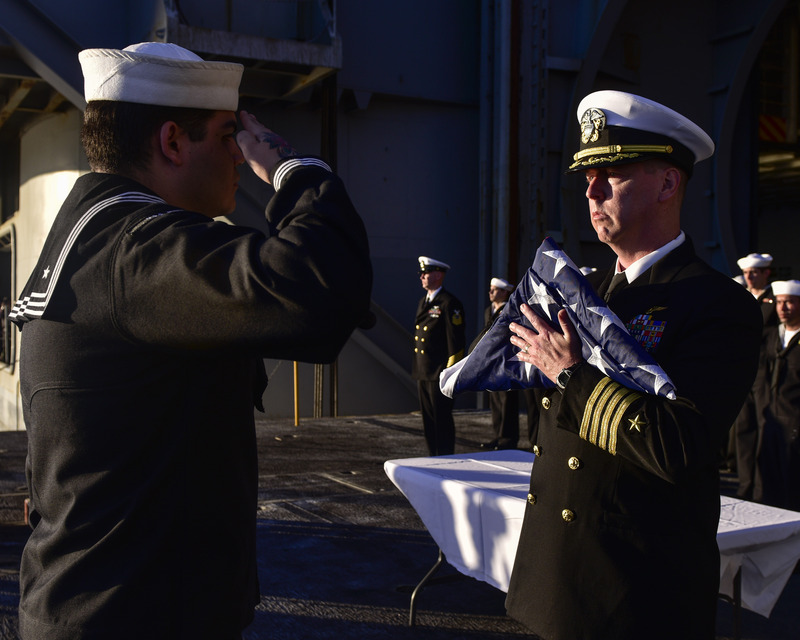 PACIFIC OCEAN – Sailors aboard the aircraft carrier USS Nimitz (CVN 68) laid to rest 17 service members and one civilian during a burial at sea held Dec. 6, in the Pacific Ocean. The service members and one civilian were committed to the sea by way of six caskets and 12 urns with full military honors after a ceremony officiated by Nimitz’s command chaplains and Commanding Officer Capt. Kevin P. Lenox. The chaplain recognized each service member individually as they were laid to rest, including Machinist’s Mate 2nd Class Thomas Walters, the grandfather of Nimitz’s own Personnel Specialist 1st Class Sarah Enciso, from Ottawa, Kan. The tradition of a burial at sea dates back to the days of sailing ships. At the formation of the U.S. Navy, the body was sewn into a shroud of sail cloth and sent over the side with a religious ceremony. Active duty service members, retirees and veterans who were honorably discharged, Military Sealift Command personnel and any dependents of active duty personnel may request a burial at sea. Family members are given a letter of condolence as well as a national ensign, photos of the ceremony and the navigational chart of the location where the ceremony took place. The Nimitz Carrier Strike Group is on a regularly scheduled deployment to the Western Pacific. The U.S. Navy has patrolled the Indo-Asia-Pacific region routinely for more than 70 years promoting peace and security.